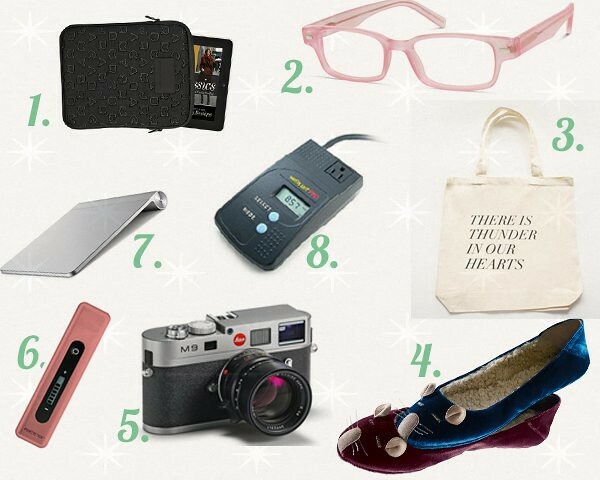 Wishlists are fleeting for me, but these are the things I've had my eye on throughout the year. It sounds silly but wanting things makes me feel guilty. It doesn't help that I have ridiculous taste. Buying for myself makes me feel worse. So let's hope Santa can smooth out that detail by getting a thing or two on the list for me. 1.MBMJ iPad Case. Having an iPad should be nice enough, but no, I'm greedy and I want it to be wrapped in a sleek case by Marc himself. 2. Warby Parker Japhy in Pink. Yes, I already have a pair and I want another. Plus, pink is a good color on me (so I'm told). 3. fieldguided there is thunder in our hearts tote. I have a couple tote's already, but how cool would I look with this strapped around my tattooed sleeve walking out of the library? Very! Plus, it's such a beautiful quote. Good job, Anabela and Geoff. 4. MBMJ Velvet Slippers. I already own the actual mouse shoes, but these sound so opulent. Working from home should be luxury enough, right? Nope, I want to stroll around my living room in the most decadent velvet slippers during the day. 5. Leica M9. I collect cameras all year 'round but that's not enough for me. I'm ridiculous and want a $7,000 camera. Oh, that's just the body alone. Add another $4,000 for the lens. 6. Pink 8g PowerstickA USB Powered Portable charger. So not needed but so going on my greedy wishlist. This would be a big help when I'm away from my phone charger. Although, I'd have to remember to charge this. Vicious cycle, I tell you. 7. Apple Magic Trackpad.I already use a Bamboo tablet but I want to match my iMac with the right accessories. *rolling eyes* It's gotta match, you know? Just kidding. I feel I'll have more control with the Trackpad. 8. Watt's Up Pro?I want to knowhow much power I'm using, and this is one of the few legit products to measure it. What's the most decadent item on your holiday list?